For her mother, see Rose Elizabeth Fitzgerald. Rosemary Kennedy in 1938, three years before her lobotomy, ready to be presented at Court. Rose Marie "Rosemary" Kennedy (September 13, 1918 – January 7, 2005) was the oldest daughter born to Joseph P. Kennedy Sr. and Rose Fitzgerald Kennedy. She was a sister of President of the United States John F. Kennedy and Senators Robert F. Kennedy and Ted Kennedy. Kennedy was intellectually disabled and was educated separately from other students. She was able to participate in social events, and her disability was carefully concealed from the public by her prominent family. In 1938, while her father was serving as U.S. Ambassador to the United Kingdom, Kennedy was presented to King George VI and Queen Elizabeth at Buckingham Palace. In her early young adult years, Kennedy experienced seizures and violent mood swings. In response to these and other difficulties, Kennedy's father arranged a prefrontal lobotomy for Kennedy when she was 23 years of age. The procedure failed, leaving Kennedy permanently incapacitated and rendering her unable to speak intelligibly. Kennedy spent most of the rest of her life being cared for in an institution in Jefferson, Wisconsin. While she was initially isolated from her relatives following her lobotomy, Kennedy visited with her family during her later life. 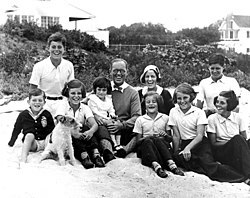 The Kennedy family at Hyannis Port, Massachusetts, in 1931 with Rosemary on the far right. Rose Marie Kennedy was born at her parents' home in Brookline, Massachusetts. She was the third child and first daughter of Joseph P. Kennedy Sr. and Rose Fitzgerald. She was named after her mother, and commonly called "Rosemary" or "Rosie." During her birth, the doctor was not immediately available and the nurse ordered Rose Kennedy to keep her legs closed, forcing the baby's head to stay in the birth canal for two hours. The action resulted in a harmful loss of oxygen. As Rosemary began to grow, her parents noticed she was not reaching the basic development steps an infant or a toddler normally reach at a certain month or year. At two years old, she had a hard time sitting up, crawling, learning to walk and later on feeding herself. Rosemary was intellectually disabled, although there is uncertainty about the full nature and scope of her disability. By Massachusetts state law, the Binet intelligence test was given to her before first grade, as she twice failed to advance from kindergarten. She was deemed to have an IQ between 60 and 70. A biographer wrote that Rose Kennedy did not confide in her friends and that she pretended her daughter was developing typically, with relatives other than the immediate family knowing nothing of Rosemary's reported low IQ. Despite the help of tutors, Rosemary had trouble learning to read and write. At age 11, she was sent to a Pennsylvania boarding school for the intellectually disabled. At age 15, Rosemary was sent to the Sacred Heart Convent in Elmhurst, Providence, Rhode Island, where she was educated separately from the other students. Two nuns and a special teacher, Miss Newton, worked with her all day in a separate classroom. The Kennedys gave the school a new tennis court for their efforts. Her reading, writing, spelling, and counting skills were reported to be at a fourth-grade level. She studied but may have felt she disappointed her parents, whom she wanted to please. During this period, her mother arranged for her older brother John to accompany her to a tea-dance. Thanks to him, she appeared "not different at all" during the dance. "Went to luncheon in the ballroom in the White House. James Roosevelt took us in to see his father, President Roosevelt. He said, 'It's about time you came. How can I put my arm around all of you? Which is the oldest? You are all so big.'" "Have a fitting at 10:15 Elizabeth Arden. Appointment dress fitting again. Home for lunch. Royal tournament in the afternoon." "Up too late for breakfast. Had it on deck. Played Ping-Pong with Ralph's sister, also with another man. Had lunch at 1:15. Walked with Peggy. Also went to horse races with her, and bet and won a dollar and a half. Went to the English Movie at five. Had dinner at 8:45. Went to the lounge with Miss Cahill and Eunice and retired early." I have always had serious tastes and understand life is not given us just for enjoyment. For some time past, I have been studying the well known psychological method of Dr. Maria Montessori and I got my degree in teaching last year. In 1938, Kennedy was presented to King George VI and Queen Elizabeth at Buckingham Palace during her father's service as the United States Ambassador to the United Kingdom. Kennedy practiced the complicated royal curtsey for hours. At the event, she wore a gown made of white tulle with a net train and carried a bouquet of lilies of the valley. Just as Rosemary was about to "glide off" by stepping to the right, she tripped and nearly fell. Rose Kennedy never discussed the incident and treated the debut as a triumph. The crowd made no sign, and the King and the Queen smiled as if nothing had happened. One Kennedy family biographer termed her "absolutely beautiful" with "a gorgeous smile." At 20, she was "a picturesque young woman, a snow princess with flush cheeks, gleaming smile, plump figure, and a sweetly ingratiating manner to almost everyone she met". According to Eunice Kennedy Shriver, when Rosemary returned to the United States from England in 1940, she regressed; Shriver later stated that Rosemary became "'increasingly irritable and difficult'" at age 22. Rosemary would often experience convulsions and fly into violent rages in which she would hit and injure others during this period. After being expelled from a summer camp in western Massachusetts and staying only a few months at a Philadelphia boarding school, Rosemary was sent to a convent school in Washington, D.C. Rosemary began sneaking out of the convent school at night. The nuns at the convent thought that Rosemary might be involved with men, and that she could contract a sexually transmitted disease or become pregnant. Her occasionally erratic behavior frustrated her parents, who expected all of their children to behave appropriately, be goal-oriented, and act competitively. Joseph P. Kennedy was especially worried that his daughter's behavior would shame and embarrass the family and damage his and his children's political careers. We went through the top of the head, I think she was awake. She had a mild tranquilizer. I made a surgical incision in the brain through the skull. It was near the front. It was on both sides. We just made a small incision, no more than an inch." The instrument Dr. Watts used looked like a butter knife. He swung it up and down to cut brain tissue. "We put an instrument inside", he said. As Dr. Watts cut, Dr. Freeman asked Rosemary some questions. For example, he asked her to recite the Lord's Prayer or sing "God Bless America" or count backwards. ... . "We made an estimate on how far to cut based on how she responded." . ... . When she began to become incoherent, they stopped. Based in part on the interview with Dr. Watts, the Kessler book says that for political reasons, Joe Kennedy covered up the fact that his daughter Rosemary was mentally ill rather than retarded, as the family has long claimed. Dr. Watts told Kessler, a former Washington Post reporter, that in his opinion, Rosemary had suffered not from mental retardation but rather from a form of depression. "It may have been agitated depression," Dr. Watts said, using a term then used to describe patients who seemed overwrought or agitated. "You're agitated, you're shaky. You talk in an agitated way. All kinds of things go on in the eyes." The book says that a review of all of the papers written by the two doctors confirmed Dr. Watts' declaration. All of the patients the two doctors lobotomized were diagnosed as having some form of mental disorder." After the lobotomy, it quickly became apparent that the procedure was not successful. Kennedy's mental capacity diminished to that of a two-year-old child. She could not walk or speak intelligibly and was incontinent. After the procedure, Rosemary was immediately institutionalized. She initially lived for several years at Craig House, a private psychiatric hospital an hour north of New York City. In 1949, she was relocated to Jefferson, Wisconsin, where she lived for the rest of her life on the grounds of the St. Coletta School for Exceptional Children (formerly known as "St. Coletta Institute for Backward Youth"). Archbishop Richard Cushing had told her father about St. Coletta's, an institution for more than three hundred people with disabilities, and her father traveled to and built a private house for her about a mile outside St. Coletta's main campus near Alverno House, which was designed for adults who needed lifelong care. The nuns called the house "the Kennedy cottage". Two Catholic nuns, Sister Margaret Ann and Sister Leona, provided her care along with a student and a woman who worked on ceramics with Rosemary three nights a week. Alan Borsari supervised the team and was able to call in specialists. Rosemary had a car that could be used to take her for rides and a dog whom she could take on walks. In response to her condition, Rosemary's parents separated her from her family. Rose Kennedy did not visit her for twenty years. Joseph P. Kennedy Sr. did not visit his daughter at the institution. In Rosemary: The Hidden Kennedy Daughter, author Kate Clifford Larson stated that Rosemary's lobotomy was hidden from the family for twenty years. While her older brother John was campaigning for re-election for the Senate in 1958, the Kennedy family explained away her absence by claiming she was reclusive. The Kennedy family did not publicly explain her absence until 1961, after John had been elected President. The Kennedys did not reveal that she was institutionalized because of a failed lobotomy, but instead said that she was deemed "mentally retarded". In 1961, after Joseph P. Kennedy Sr. suffered a stroke that left him unable to speak, Rosemary's siblings were made aware of her location. Her lobotomy did not become public knowledge until 1987. Following Rosemary's father's death in 1969, the Kennedys gradually involved Rosemary in family life again. Rosemary was occasionally taken to visit relatives in Florida and Washington, D.C., and to her childhood home on Cape Cod. By that time, Rosemary had learned to walk again but did so with a limp. She never regained the ability to speak clearly, and her arm was palsied. Her condition is sometimes credited as the inspiration for Eunice Kennedy Shriver to later found the Special Olympics, although Shriver told The New York Times in 1995 that this was not entirely the case. In 1983, the Kennedy family gave $1 million to renovate Alverno House. The gift added a therapeutic pool and enlarged the chapel. Rosemary Kennedy died from natural causes on January 7, 2005 at the age of 86. Kennedy died at the Fort Atkinson Memorial Hospital in Fort Atkinson, Wisconsin with her surviving siblings (sisters Jean, Eunice, and Patricia and brother Ted) by her side. She was buried beside her parents in Holyhood Cemetery in Brookline, Massachusetts. She was the first child of Joseph and Rose Kennedy to die from natural causes. ^ "Rosemary Kennedy". jfklibrary.org. Retrieved September 6, 2015. ^ Gibson, Rose Kennedy and Her Family, includes Rosemary's diaries Archived January 30, 2005, at the Wayback Machine from 1936–1938. ^ Leamer, pp. 254, 270, 680. ^ O'Brien, Gerald (July 2004). "Rosemary Kennedy: The Importance of a Historical Footnote". Journal of Family History. 29 (3): 225–236. doi:10.1177/0363199004266849. ^ a b c d e f "The Exiled Kennedy". independent.co.uk. January 15, 2005. ^ Jennie Weiss Block (2002). Copious hosting: A theology of access for people with disabilities. Continuum International Publishing Group. p. 56. ISBN 9780826413499. ^ "Rosemary Kennedy: The Truth About Her Lobotomy : People.com". PEOPLE.com. Retrieved September 6, 2015. ^ Morris, Sylvia Jukes, "The Saddest Story Ever Told", Wall Street Journal, October 2, 2015. Retrieved 2015-10-03. ^ Kessler, Ronald, The Sins of the Father, Warner Books, 1996, p. 243. ^ Kessler, Ronald, The Sins of the Father, p. 244. ^ Kessler, Ronald, The Sins of the Father, Warner Books, 1996, p. 244. ^ Henley, John (August 12, 2009). "The Forgotten Kennedy". The Guardian. ^ Leamer, p. 412, and caption to photo of the house facing p. 650. ^ a b Leamer, pp. 412, 680. ^ a b Leamer, p. 760. ^ Collier, Peter; Horowitz, David (1984). The Kennedys. Summit Books. p. 116. ISBN 978-0-671-44793-9. ^ Johnson, Kirk (June 23, 1995). "Reaching the Retarded: An Old Kennedy Mission". The New York Times. Retrieved July 5, 2011. ^ "Sister of President John F Kennedy dies". The Daily Telegraph. January 8, 2005. Retrieved January 24, 2013. ^ Cornwell, Rupert (January 10, 2005). "Obituaries: Rosemary Kennedy". The Independent. Retrieved January 24, 2013. ^ Weil, Martin (January 8, 2005). "Rosemary Kennedy, 86; President's Disabled Sister (washingtonpost.com)". The Washington Post. p. B06. Retrieved January 24, 2013. ^ Yadira Chavez (December 6, 2018). "Rosemary Kennedy: A Life Stolen By Mental Illness And Her Family". St. Mary's University History Media Project. Retrieved March 6, 2019. Shriver, Timothy (2014). Fully Alive: Discovering What Matters Most. New York, NY: Sarah Crichton Books-Farrar, Straus and Giroux. Larson, Kate. Rosemary: The Hidden Kennedy Daughter.